Our non-slip socks give your feet traction on the mat and barre helping you maintain proper form throughout your workout. 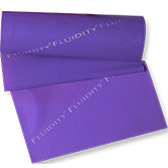 4' band provides light resistance for strengthening and stretching. Ideal for beginner levels. 5' band provides heavy resistance for strengthening and stretching. Ideal for advanced levels. The ultimate tiny accessory! 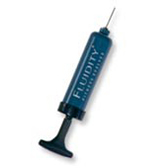 Easily inflate our Fluidity Ball with this handy 5-inch pump. 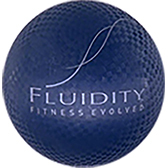 Our 8 1/2" playground ball is designed to make even our most advanced Fluidity positions more challenging and fun. 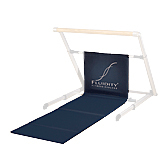 Already a Barre owner? 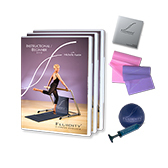 Start with our 3-in-1 Instructional DVD and DVD accessories. Like a tune-up for your Barre! 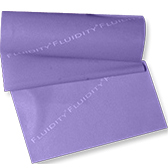 Replenish the cushioning with a fresh, new mat. Easy to get on/off the unit using Velcro closures. Accelerate your lower-body results and eliminate cellulite with this quick, but intense 20-minute workout to lift your seat and firm your thighs. Mastered our instructional DVDs? Take your workout (and your results!) 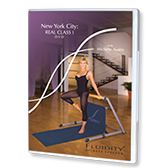 to the next level with our New York City Real Class Series - Real Class I. 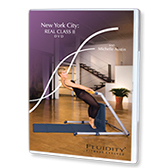 At 63 minutes, Real Class II is the ultimate whole-body challenge for even our most experienced Fluidity users! 26 minutes of pure aahhh. Include Stretch in your daily routine to help release tension in your body and increase your overall body awareness. Complete your Real Class weekly rotation with Real Class III for the rotation gym-goers rely on for fast and effective results. This DVD includes Real Classes I, II, III, and Fluidity Stretch. 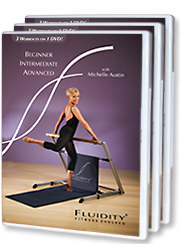 This DVD includes our Beginner (30 mins); Intermediate (37 mins); and Advanced (42 mins) Fluidity Barre workouts. For as low as $10/month! Enjoy 24/7 access to our complete digital library – on your phone, tablet or desktop. Instant access. Just press play – and start seeing and feeling - results today! All subscriptions auto renew. You may cancel at any time.